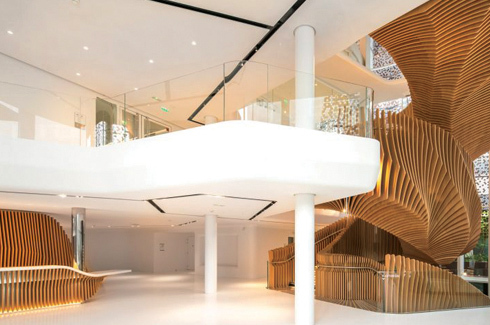 A soaring and stunning staircase designed by Ora Ïto for Louis Vuitton’s office. Sheer luxury is what comes to mind when one thinks of Louis Vuitton. Sleek and exclusive, the brand has always maintained its standard, neither dropping their quality nor price. 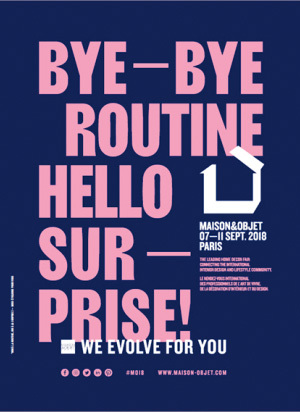 When building the LMVH (Louis Vuitton Moet Henessy Business Company & Firm) headquarters in their mother town, it was imperative that the offices exuded the class of the brand. 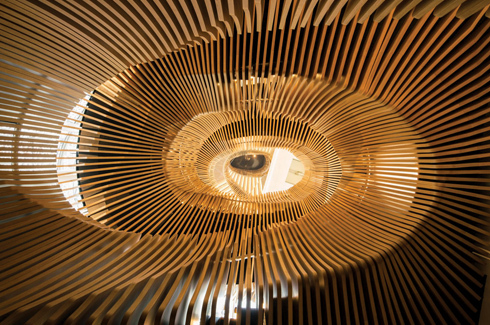 Just as a Louis Vuitton product is would stand out, the chosen French designer, Ora Ïto has conjured up a half-snake staircase design to act as a focal point for LMHV media section’s new offices in Paris to stand out. Hundreds of wooden slats have been cut and placed together to form this gargantuan centerpiece at the venue. 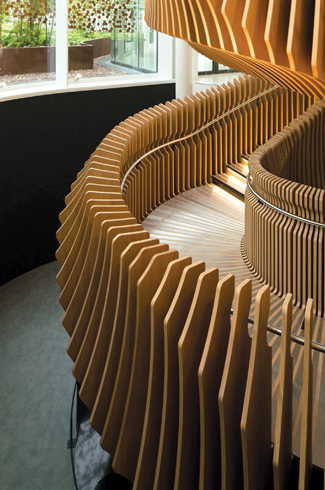 The staircase snakes up the four storeys of the office, comprising of over 400 wooden battens that cradle the underside of the stair and form the handrails on either side. Each of the slats have a curved edge detail so that when placed side-by-side; they form wave-like indents across the stair. 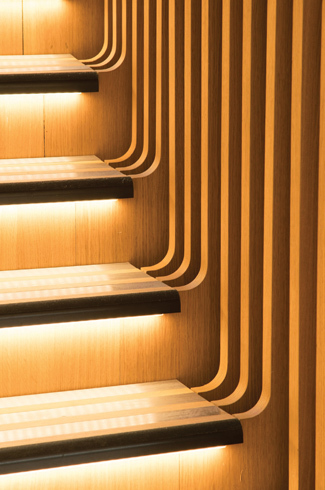 These semi-circular indents on the inner side of the slats form a nook for the steel handrail, while LED lights illuminate the undersides of the treads. A large hidden steel beam supports the slats, which is made of a mix of extremely light materials. Two layers of medium density fibreboard (MDF) are placed on either side of a metal reinforcement and then covered in the French oak veneer to match the oak steps. Lit by a huge glass wall and a roof light, the staircase is set to one side of the building, leaving plenty of open space around it. The office design is deliberately calm and minimal so that the staircase can stand out as the one statement feature. Ora Ïto has added to his already diverse portfolio including trams, spaceships and sedan chairs with this not so little masterpiece.